How to Grow Wasabi | Grow This! Wasabi is difficult to grow and not many home gardeners attempt it, but if you’re up for a challenge and have a lot of patience (it takes two years to mature), here are some tips on how to grow wasabi. This article will focus on growing wasabi in soil, which is easier than the hydroponic method commonly used commercially. Wasabi is related to cabbage and mustard and offers similar amazing health benefits as other Brassicaceae family vegetables. Known for its spicy flavor, wasabi roots are grated and made into the paste common in Japanese cuisine and served alongside sushi. The wasabi plant grows naturally along spring beds in New Zealand, Japan and other parts of Asia and has been introduced to parts of the northwest and southeast United States. Naturally, wasabi grows in extremely wet environments under natural forest canopies. Recreating this unique, natural environment to wasabi is important to its growth and can be difficult, but not impossible. Wasabi should be grown in the shade and likes the humid summers that aren’t too hot. It will not tolerate direct sunlight and should be grown in temperatures ranging from 45° F – 70° F.
Wasabi is slow growing. Be sure to choose an area of your garden that you can dedicate to your wasabi for at least 2 years, as it takes this long to mature. Wasabi will not grow in climates that have temperatures that regularly exceed 70° F or drop below 45° F. For this reason, if you don’t live in the ideal climate, you may need to grow in a green house or with shade cloth. Plant in the fall – wasabi does best in the winter and this will allow it to get off to a strong start. The most important thing is that your soil drains extremely well. Wasabi likes lots of moisture but will not tolerate soggy roots. Be sure to add lots of organic matter, such as mature compost, to the soil before planting. This will help with drainage and also get your wasabi off to a nutritious start. Wasabi seeds should be planted within 48 hours of purchase (or receiving them in the mail). Soak them in water overnight prior to planting. Sow seeds 1-2 inches apart. If transplanting seedlings, be sure to water them well before setting them out. Water wasabi well, particularly in hot or dry months. The roots should never dry out, meaning you need to keep the soil constantly moist but not muddy. Weed thoroughly around your wasabi plants to prevent root competition year round. 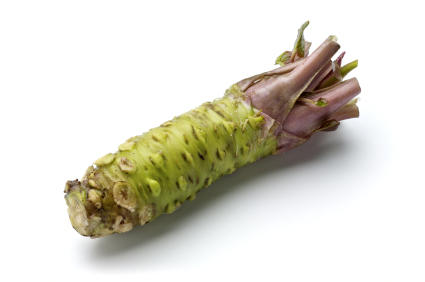 Harvest wasabi by digging up the roots and rhizomes after 18 – 24 months. The rhizomes contain the most flavor and highest concentration of nutrients. If you want to continue your wasabi crop, leave a few plants in the soil to self-seed. As long as it’s not too hot or dry, they should continue to produce yearly. Watch out for aphids and caterpillars. Pick them off and use an organic spray or other natural means to get rid of them. Harvested wasabi root will only last a couple of months. It’s best to grind it into powder for later use. That powder can be mixed with water to create the puree that is commonly used with sushi. Do you have tips or questions about how to grow wasabi? Let us know in the comments below.